This adorable, quiet cottage is within a short walk to the bay beaches, a 2 minute ride to the ocean beaches, and 3 miles from Provincetown. Enjoy fine dining, walk the art galleries or just people watch. On the shuttle line to Provincetown and close to all amenities. Perfect for a couple, the cottage has a screened-in front porch, a full kitchen, gas stove and a custom made Murphy bed very comfortable, top quality mattress, made from an antique wall from a captain's house in the Outer Cape. Sunlight streams through the skylight in the cottage, through the pine beam board ceiling. Tastefully decorated with antiques and beautiful art..
Cable TV, Wifi are included. Steaks on the grill, fresh salad with herbs picked by hand from right outside your window, breeze blowing off the ocean, what a perfect ending to a day at the beach. Relaxing on the porch thinking about more beach tomorrow. Relaxing on the porch: Steaks on the grill, fresh salad with herbs picked by hand from right outside your window, breeze blowing off the ocean, what a perfect ending to a day at the beach. Relaxing on the porch thinking about more beach tomorrow. If your looking for a lovely quaint cottage to stay in North Truro then this is the place for you. We take a lot of pride in our cottage, which you will see the minute you step onto the screen in porch. The place is nicely tastefully decorated with antiques and all the charm of Cape Cod. A year has not gone by that we have not updated the cottage. Newer bath, freshly painted, bead board ceilings most recently new futon, antique coffee table and doors. It is close enough to Provincetown, (7 minutes) and the best beached in the country, but yes far enough to enjoy the tranquility. Tiled Bathroom - Completly renovated, shower, sink and toilet A lovely outdoor shower, great to use after a long day at the beach or kayaking. Will consider a well behaved pet, smoking is not permitted in the cottage. Peaceful and relaxing cottage in Truro. Very quiet and relaxing place to stay. Although this is a small cottage it is very well equipped, tastefully decorated and comfortable. The screened in porch and outdoor shower were awesome to have. David was extremely prompt, professional and easy to deal with. Even left a welcoming bottle of wine from the Truro Vineyards. I would highly recommend this cottage . It's a great value in a very tranquil setting. Thank you for your review. I am glad that you enjoyed your visit in North Truro and the cottage. Mike and my goal is to make everyone’s stay special. I felt right at home in this comfortable, charming cottage. I enjoyed the updated kitchen and bathroom, while wifi access was also a plus, even on vacation. The screened-in porch and the lovely flowers added to the charm! Thank you I am glad you felt right at home. That is the objective. 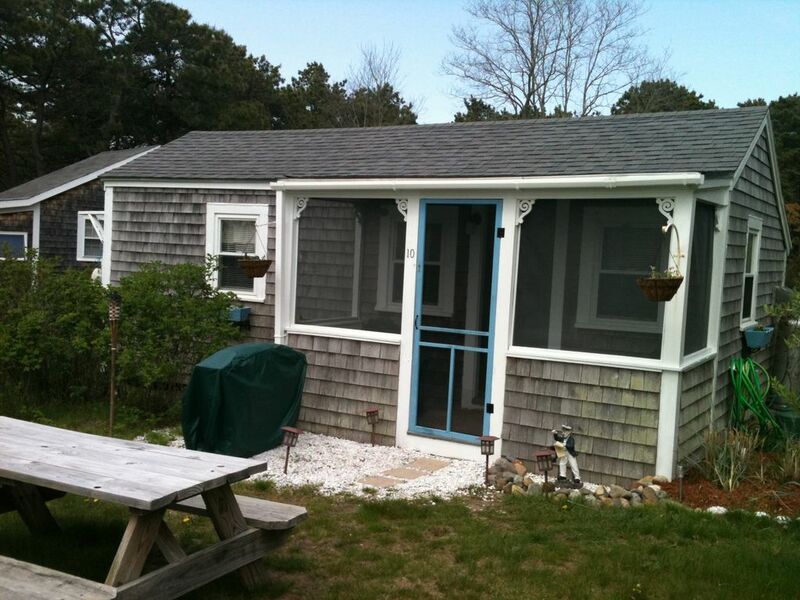 This cottage is perfect for a quiet getaway as well as a location that lets you enjoy the best of Ptown. The cottage is nicely decorated, cozy, and homey. Having a kitchen and outdoor grill makes eating meals easy and more affordable. An outdoor shower is just wonderful after a busy day of running around. I often use my bike to get into Ptown but there is a bus closeby for the trip into town without having to deal with parking your car. I have rented this cottage for a number of years and am looking forward to visiting again in 2016. This little home away from home is all ours for one week every June. You couldn't feel more at home. Everything you need is in this little cottage in a big way. The picture doesn't do it justice. If you feel like stepping out everything is within reach. There is a winery ,a spice market, beachy shopping, food or just snacking. An artsy area and beaches bay and ocean side. Miles and miles of walking and bike trails. Friendly people all around. Don't forget the flea market in Welfleet and the oysters in P Town! The owners are down to earth and amazing! Sound too good to be true? You will just have to see for yourself! We really are glad you feel this way. We take a lot of pride in our cottage and our guests as well. We love it from the charm of the cottage, sitting on the porch watching the birds and the smell of salt air. To the herb garden and flowers. My husband and I have been staying at this little cottage for the past three years. It's comfortable and well equipped and immaculately clean, and gets better every year. Tucked away at the back of a quiet cottage community, you're surrounded by nature but near everything at the same time. We enjoy sitting on the little porch with coffee in the morning, watching turkey and other wildlife meander through. While not fancy it is homey, comfortable and so very restful. Our black lab loves it too! Can't wait to return.